Charlotte Fraser returns to her late father's once-flourishing rice plantation on the Waccamaw River, determined to continue growing the special kind of rice known as Carolina Gold. But Fairhaven Plantation is in ruins, the bondsmen are free, and money is scarce. To make ends meet, Charlotte reluctantly accepts a position as tutor to the young daughters of Nicholas Betancourt, heir to the neighboring Willowood Plantation. Then Nick's quest to prove his ownership of Willowood sends Charlotte on a dangerous journey that reveals an old family mystery---and threatens all that she holds dear. 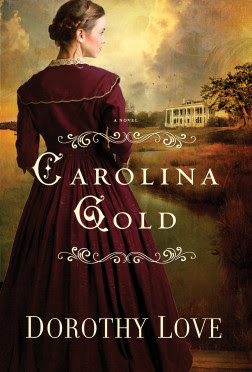 Inspired by the life of a 19th century woman rice planter, Carolina Gold continues Dorothy Love's winning tradition of weaving together mystery, romance, and rich historical detail, bringing to life the story of one young woman's struggle to restore her ruined world. To keep up with Dorothy Love, visit www.dorothylovebooks.com, become a fan on Facebook (Dorothy Love Books) or follow her on Twitter (@writerDorothy). I really liked the Southern Lowcountry style of this book. Although not all of Charlotte's circumstances were pleasant, the descriptive writing of the post-war South and plantation restoration was smooth and warm, bringing to my mind scenes from the movie Gone with the Wind. Charlotte's solo trip to New Orleans, with such little evidence, seemed a little far-fetched for a genteel 19th-century woman, but my imagination liked that she cared so much about others to do what she thought was right. And Josie! My, what a spoiled Southern girl she seemed to be! I especially love when authors are inspired by the life of a real person and I enjoyed this fictionalized story of Mrs. Pringle, a long ago rice farmer. Thank you to Dorothy and Thomas Nelson through Litfuse for sending me a copy to read and review!